Using animals is a privilege to create knowledge. We learn from them for the benefit of the community of other animals and humans, as models in research, and to promote the environment. How we use animals is more than being compliant with regulations and guidelines, however. There are scientific and ethical considerations, too. This webpage is meant to describe what Chapman University does to ensure that research, testing, and teaching activities involving animals is conducted humanely. Call before you dig – This phrase, taken from the utility industry, is meant to take precautionary steps BEFORE diving into an action which might cause an accident or result in something unwanted. The same applies to conducting animal research. Contact the IACUC office to discuss your study as it pertains to considerations for animal welfare, writing your protocol, and obtaining knowledge. The IACUC and the Research Office at Chapman rely on the observations of individuals to ensure the well-being of all animals used in research and/or teaching. All personnel -- including investigators, members of the public, and animal husbandry staff -- are encouraged to express their concern, if they: see animals that appear to be in pain/distress, witness or are involved in an incident that may impact the welfare of laboratory animals at Chapman, have a concern about the conduct of personnel handling laboratory animals, and/or have a concern about protocol integrity or possible scientific misconduct. To make a report, see this chart as represented above, contact the IACUC office, or go directly to the research link from Chapman's internal audit (ethics) office. 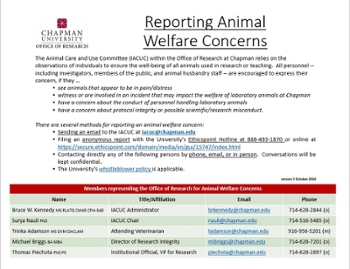 The IACUC is charged with institutional oversight of and has the responsibility for animal welfare at Chapman. It is constituted by scientists from campus, a veterinarian trained in laboratory animal medicine, and an unaffiliated member representing the public’s interests. Together with researchers, the obligation is to fulfill the duties of humane care and use of animals. Some of the important topics, which are supported by a variety of practical, ethical, and scientific principles, are described below. The community member is very important on the IACUC as the one who brings to the Chapman animal care and use program another perspective. This position, which is mandated by federal animal regulations, is intended to add the public’s perspectives about animal welfare to the institution as a participant in IACUC deliberations. The Office of Research at Chapman submits and updates an Animal Welfare Assurance (#D17-00960) to the NIH Office of Laboratory Animal Welfare. It is a nod to our intentions for regulatory compliance with OLAW and the Public Health Service (PHS) Policy on Humane Care and Use of Laboratory Animals. It addresses our obligations and responsibilities pertaining to animal research conducted with federal funds. Semi-annual inspections - The PHS Policy on Humane Care and Use of Laboratory Animals, section IV.B.1.-2., requires the IACUC to review the institution's program for humane care and use of animals and inspect all of the institution's animal facilities at least once every 6 months using the ILAR Guide for the Care and Use of Laboratory Animals as a basis for evaluation. Chapman conducts its semi-annual inspections during the spring and fall. A form called the yellow sheet (because it is printed on firm yellow paper) is provided to assist and guide the IACUC members in its oversight of the programs and facilities for the care and use of animals. Regulatory authority pertaining to animal welfare – As stated in the regulations (Animal Welfare Act, 9 CFR § 2.31(c)(4)), the IACUC is required to "review, and, if warranted, investigate concerns involving the care and use of animals at the research facility resulting from public complaints received and from reports of noncompliance received from laboratory or research facility personnel or employees." The regulations and Chapman’s policies provide protection against discrimination or other reprisals for reporting violations ("whistleblower protection"). The regulations provide that "No facility employee, Committee member, or laboratory personnel shall be discriminated against or be subject to any reprisal for reporting violations of any regulations or standards under the Act." See Reporting Animal Welfare Concerns. Maintaining disaster plans for emergencies like earthquakes and fires - Individual plans address the specific species concerns of the animal facility should an emergency occur. Being mindful of business continuity issues, such that provisions like feed and water, conditioned air (HVAC), and utilities are always available - Similar to the disaster plan, ensuring the operations of the animal facilities on a daily basis (365 days per year) is the responsibility of the management team. Researchers need to make every effort to plan their studies in order to use the most appropriate animal model for the disease being studied. A model stands in for something else. In research, mice are frequently used to model disease process and human conditions. There are now 1000s of genetically-engineered mice. Hundreds of different species other than mice have been used in research – examples at Chapman included zebrafish to evaluate drugs, birds to learn about behavior, and hagfish to study defensive slime. From an ethical standpoint, it would be great if all research work could be done with alternatives to animals such as cells, i.e. in vitro. But in science there are still many problems that need to be addressed with animals, i.e., in vivo. 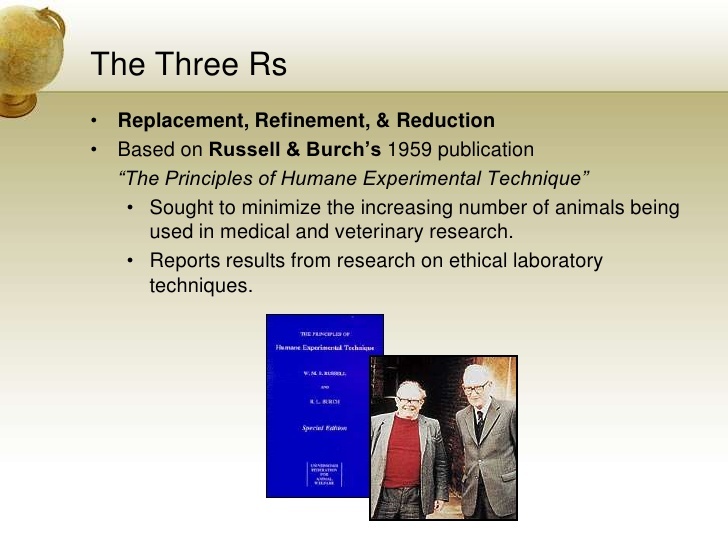 The 3Rs stand for Replace, Reduce, and Refine, based upon concepts put forth by Russell and Burch in their 1959 book, The Principles of Humane Experimental Technique (see below). Replacement – Over the years of animal research, many procedures involving animals have been eliminated. For example, rabbits and frogs are not used for pregnancy testing. The PI is obligated to consider replacing animals in their studies and when not possible must justify the use. Reduction – The number of animals to be used must also be justified by the PI(s) in the animal use protocol. The intent is to use the fewest animals per the 3Rs and to do that might require the assistance of a bio-statistician. Sometimes, researchers are surprised that they should use an “N” of a greater value in order to find statistical differences in the results. While seeming to be to the contrary, overall fewer animals will be used. Refinement – If you can’t reduce the number of animals, or replace them entirely, then the obligation of the research team is to refine the processes used. Examples include training on procedures, developing competency, using inanimate models for techniques, assuring that assays are effective before taking samples from animals, reviewing the literature for related studies, and more. Putting it all together, the IACUC expects that personnel involved in the handling of fish, as an example, will understand the procedures and techniques that are described in the animal protocol. Only those procedures that have been described in the approved animal use protocol can be performed. Amendments to the animal use protocol must be considered by the IACUC and approved for additional procedures. A summary of the role of the laboratory animal veterinarian can be found at this NIH site. The IACUC is responsible for assessing the category of pain and distress - “B”, “C”, “D”, and “E” - according to the USDA categories as shown in the chart below from USDA’s Form 7023. At Chapman, the same designations are used for all species, beyond what are known as the USDA-covered species (see column A in the table), which don't include rats, mice, and birds. Researchers are obligated to determine where, that is in which category, the animals fall during the course of their studies. Number of animals being bred, conditioned, or held for use in teaching, testing, experiments, research, or surgery but not yet used for such purposes. Number of animals upon which teaching, research, experiments, or tests were conducted involving no pain, distress, or use of pain-relieving drugs. Number of animals upon which experiments, teaching, research, surgery, or tests were conducted involving accompanying pain or distress to the animals and for which appropriate anesthetic, analgesic, or tranquilizing drugs were used. Deviations from standard practices – The ILAR Guide, AVMA Guidelines on Euthanasia, and other reference sources provide information on accepted husbandry and procedures with animals. Research and teaching with animals are both dynamic activities and different approaches are to be expected. Animal use protocols must describe adequately what will be done with animals. 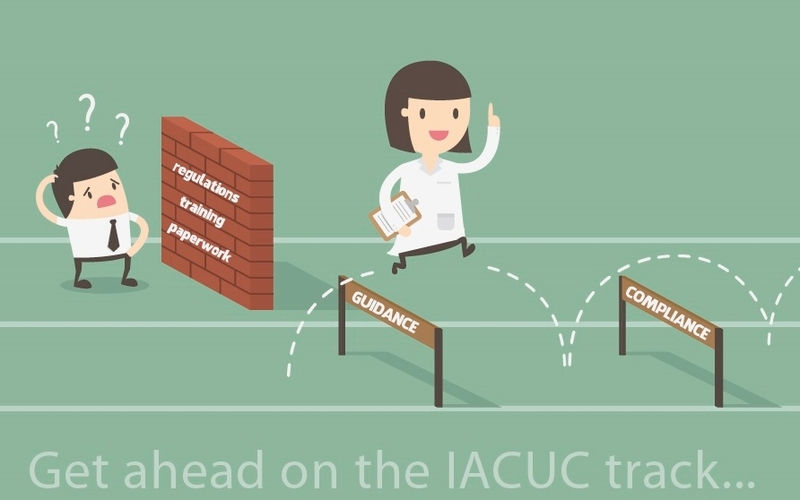 Any changes must be considered by the IACUC: those from the approved protocol constitute an amendment and those from standard practices are labeled deviations. Both must be documented in the IACUC’s review and approval processes. Navigating the hurdles is a given. Investigators and instructors using animals should consult with the IACUC, the veterinary team, and the Office of Research for assistance. Perhaps a means to lower the hurdle -- not go around or underneath it -- for both science and animal welfare can be worked out. It is acknowledged that many ethical issues surround the conduct of research with animals. Chapman recognizes the concerns of animal activist organizations. Conversations including many perspectives are warranted, which is accomplished by: attending conferences, hosting webinars, holding memberships with various animal societies, inviting speakers to IACUC meetings, engaging with the community/public member of the IACUC, and distributing relevant articles from the popular press and scientific journals. FBR - The Foundation for Biomedical Research (FBR) is dedicated to improving human and animal health by promoting public understanding and support for humane and responsible animal research. AVMA - The American Veterinary Medical Association (AVMA) provides information about animal welfare. CBRA/CSBR - The California Society for Biomedical Research (CSBR) is dedicated to improving human and animal health by promoting public understanding and support for medical research and discovery through life science education and outreach. The animal research office from Columbia University specifically addresses the considered and humane use of research animals.